In MSIA, we have a wonderful Spirit-based tool at our disposal called seeding to assist us in living an abundant life. We use it to work in loving partnership with God to manifest what we would like to bring forward into our lives, for the highest good of all concerned. 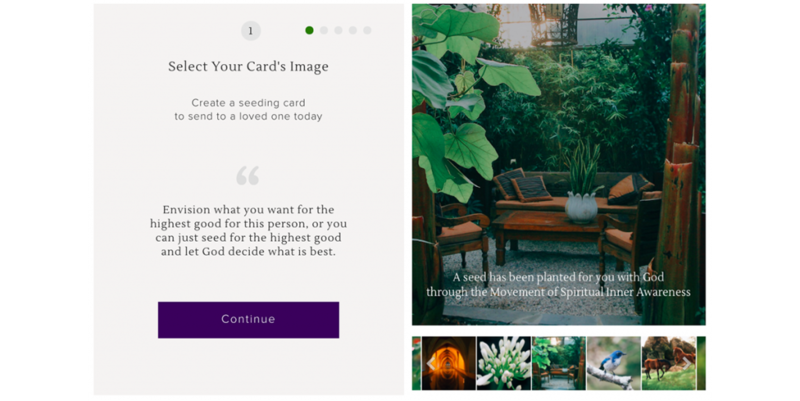 MSIA has just launched a new seeding card portal where you can send someone an email seeding card with a beautiful image and a personal message. Or, if you prefer, you can choose your image and send the card anonymously. Although our new seeding cards were only just launched this past week, we are already hearing heartwarming, astonishing stories from the people who have received them. Seeding cards are a wonderful way to reach out to others to share our loving and call forward God’s presence to assist them. The seeding cards are available in English and the Spanish version is being developed. If you would like to learn more about the process of seeding, MSIA has a seeding resource page with everything you need to know to begin: how to seed, inspirational seeding stories, questions and answers, and a lot more. I received one of the new seeding cards for my DSS Graduation. It was the highlight of my day and quite beautiful. I am always so appreciative of how you on staff are continuously upgrading what we do to better and more beautiful and more inviting for people to participate.